What do you get when you mix ping pong balls and a classic experiment from 1909 that probed the structure of the atom? You guessed it: Rutherford’s Rampage. Students from the NanoEngineering & Technology Society at UC San Diego gave passers by the opportunity to play Rutherford’s Rampage on Tuesday afternoon at Engineers on the Green, a student organization fair at the UC San Diego Jacobs School of Engineering. “Rutherford” refers to the early 20th Century Rutherford Experiment which provided the first experimental evidence for the atomic nucleus. I remember learning about this “gold foil” experiment in physics class and got a kick out of the exhibit-booth homage to the experiment. Plus, the game is fun to play. If you successfully toss a ping pong ball into one of the holes, you are referencing the times when positively charged alpha particles passed by the atomic nuclei in the very thin sheet of gold foil they were shot at. When your ping pong ball hits gold foil and bounces back, that represents the times that positive particles encountered an atom and bounced back. If I played long enough, I probably even might have even grazed the edge of one of the holes – recreating instances in which the positive particles passed through the foil, but had their trajectory changed by atomic nuclei. Rutherford’s Experiment is also known at the Geiger-Marsden experiment or Gold foil experiment. Sure, the game takes some creative license…I don’t think there were points assigned to various sections of gold foil that gave positive particles safe passage. But even the premise is right on: the game looks easier than it actually is. I was less successful in getting ping pong balls to pass through the foil unperturbed…and this parallels the scientific findings. If the “Plum Pudding” model had been accurate, then more of the positive particles should have sailed through the foil than actually did. When I stopped by the booth, NanoEngineering major Allen Pei and Syed Sadat Nazrul (double major in NanoEngineering and Economics) were running Rutherford’s Rampage. Hat tip to TESC (the Triton Engineering Student Council) for organizing Engineers on the Green. The University of California, San Diego, recently dedicated a one-of-a-kind building, which is home to structural engineers, nanoengineers, medical device researchers and visual artists. Best-selling science fiction author and UC San Diego alumnus David Brin was the keynote speaker at the event and imagined some of the future discoveries engineers and artists will make by working hand-in-hand. Brin is particularly well suited for this exercise. He has won both the prestigious Nebula and Hugo awards for science fiction writing and also earned a Ph.D. in physics from UC San Diego in 1981. The building will help heal the divide described by philosopher C. P. Snow 50 years ago between the academic culture of the hard sciences and the arts and humanities, Brin said. “This building will thrive because its cells are leaky, its structures malleable and adaptable to changing needs—deliberately almost biological,” he said. Photos from Engineers on the Green, here at the Jacobs School of Engineering are up on the Jacobs School Facebook page. Nice work TESC, IDEA Student Center, and all the Jacobs School student orgs who participated. Yeshaiahu (Shaya) Fainman, professor and chair of the UC San Diego Department of Electrical and Computer Engineering, is among the 50 most published authors in Applied Optics, according to the journal's 50th Anniversary site. The Jacobs School’s new Structural and Materials EngineeringBuilding was packed to the rafters Sept. 14 for the official dedication ceremony. Science fiction author and UC San Diego alumnus David Brin ('81) read an essay written for the occasion titled, "The New Modernism: Blending Science, Engineering, Art and the Human Imagination." This building will thrive because its ‘cells’ are leaky,” Brin said. 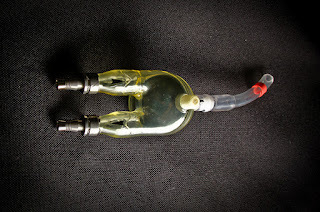 “Its structure is malleable and adaptable to changing needs, deliberately almost biological. Not a rigid expression of one architect’s ego, but a willing servant to many more generations of pioneers, who will work within these walls. And who will want to move some of the walls, to make this structure truly theirs. 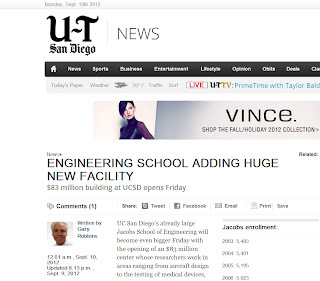 The new building was also featured in a front page story in the UT San Diego, and online following the event, which was attended by UC San Diego Chancellor Pradeep Khosla, State Assemblyman Nathan Fletcher, and Irwin Jacobs, Qualcomm's founding chairman and CEO emeritus. The new building has attracted support from Cymer, a San Diego company co-founded by UC San Diego alumni, Dr. Bob Akins (‘74, ‘77, ‘83) and Dr. Richard Sandstrom (‘72, ‘76, ‘79). Enabling the commercialization of today’s advanced consumer electronics devices, Cymer is a leading developer of light sources used by chipmakers worldwide. Cymer’s generous gift is being used to outfit the building, including the three-story Cymer Conference Center, which will cultivate a hub for industry collaboration and innovation. Many thanks to David Brin for the great speech at the dedication event tonight for the Structural and Materials Engineering building here at the UC San Diego Jacobs School of Engineering. Pulse magazine from the Jacobs School. 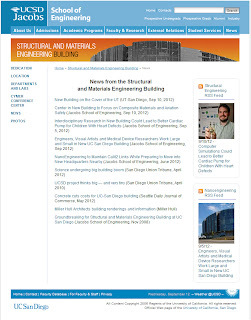 A running list of stories tied to the new Structural and Materials Engineering (SME) building is on the SME page. That's the headline for a new story that highlights a close collaboration between mechanical engineers (who are also medical device researchers) and structural engineers here at the Jacobs School of Engineering. Check out more photos on the heart pump, the researchers and their simulations on the Jacobs School Flickr feed. 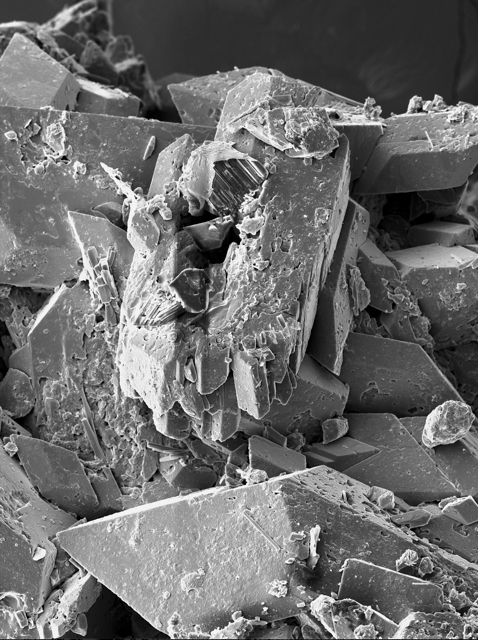 Electron microscope scan made by UC San Diego Visual Arts professor Anya Gallaccio. NanoMicroMega art exhibition is the first show for the art gallery in the new Structural and Materials Engineering building at the UC San Diego Jacobs School of Engineering. An art exhibition called “NanoMicroMega,” opening on dedication day and remaining on view through Dec. 7, will feature some of the UC San Diego arts/engineering projects already under development. These include artist Anya Gallaccio’s photographic prints made by using an electron microscope to scan nano and micro particles and Benjamin Bratton’s “Nanoskin” project, an examination of the geopolitical implications of nanoengineer Joseph Wang’s bioelectronics tattoos. Rubin Ortiz Torres will present a performance of “Hi ‘n’ Lo,” an industrial warehouse lift adapted to dance with movements inspired by low rider cars. Check out the feature on the new building at the Jacobs School. The story, by Gary Robbins, ran on the front page of today's edition of the San Diego Union Tribune (UT San Diego). The dedication for the Structural and Materials Engineering building is this Friday, here at the Jacobs School of Engineering at UC San Diego. The International Conference on Computer Design chose a paper coauthored by Dean Tullsen, a computer scientist at the Jacobs School of Engineering, and George Cai, of Intel, as one of the five mostly influential papers in the conference's 30-year history. "This is the sort of stuff that puts CSE and UCSD on the map," Rajesh Gupta, chair of computer science at the Jacobs School, wrote in an email announcing the honor. The paper, "Power-Sensitive Multithreaded Architecture," published in 2000, was first to quantify the energy advantages of multithreaded architectures, which can provide significant performance gains with marginal increased power cost. It also presented architectural optimizations which would enable a multithreaded architecture to achieve the trifecta: lower power, higher performance, and lower energy than conventional architectures. Paper co-author and Jacobs School alum John Seng, now a professor at Cal Poly San Luis Obispo, will present a retrospective on the paper during a special session at the conference, which takes place from Sept. 30 to Oct. 3 in Montreal. Read the abstract and full paper here. 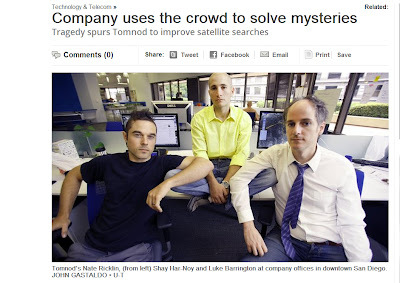 Tomnod, a company founded by Jacobs School alumni was profiled this week in the San Diego Union Tribune. Read the story by John Wilkens here.Also, keep up with Tomnod via the Tomnod blog, or Facebook feed. It's finally happening. The dedication for our new building -- which houses Structural Engineering, NanoEngineering, Visual Arts, and medical device researchers from the Center for Medical Device and Instrumentation is a week from Friday. RSVP to attend the Sept 14 event by Sept 10.